I’ve talked more than once about my love/hate relationship with Jada. Their tendency towards blinged-out customs turns me off, and the QC on their larger casts can be questionable, but when they get it right, they get it right. This is one of those cases. Snagged this Elky at Walmart last week, and it pushes a lot of my buttons. 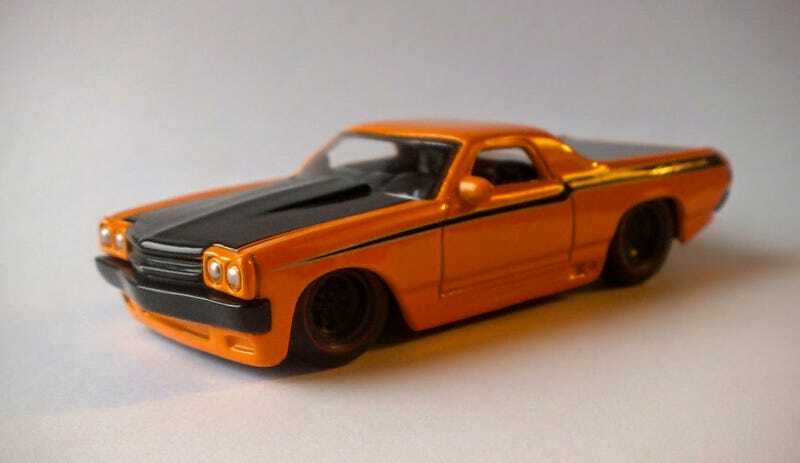 El Camino? Check. Bold color choice? Check. Not too much chrome? Big check. I love the black and orange combo, which is both cool and appropriate to the car. Aside from the SS badge being ever so slightly off-center, the tampos are good, paint is acceptable (minor flaw on the passenger door and a small chip under the right tail light). All other things being equal, I prefer my ute castings with open beds, but I can respect the choice to cover it here, given the nature of this beast. The side pipes make up for it.